•	Outfit and maintain proper safety equipment. •	Perform maintenance on the crane as needed. •	Assist construction crew on an as-needed basis. •	Welding Certification is beneficial but not required. •	Willingness to work up to 12-hour shifts, day or night, throughout the Great Lakes, with the majority of the time working within Lake Michigan and Lake Superior areas. •	Commitment to work safely and follow all safety policies and procedures. •	Complete a pre-employment physical examination, drug screen, and background check. •	Transportation to and from jobsite (valid driver’s license). •	Comfortable working on and around water. •	Team oriented with effective communication skills. •	$40+ per hour (based on specific job wage rates). •	Health, dental, and vision insurance coverage offered through United Healthcare. A portion of health insurance premium is subsidized based on employee’s years of service at the Roen Salvage Company. •	10 days paid vacation and personal time off is offered upon hire. Employees are then eligible to earn additional paid time off based on years of service at Roen Salvage Company. •	Employees are eligible to participate in the Roen Salvage Company’s 401 (k) plan. Roen Salvage Co. is a marine construction company that provides high-quality services to engineering, utility, government, municipality, harbor, and private entities located throughout the Great Lakes Region of the United States. Our services include dredging, pile driving, stone breakwaters, submarine pipelines, offshore structures, dock construction, marina construction, marine demolition, marine concrete, binwall structures, corrosion protection, hydrographic surveying, and more. We employ some of the Great Lakes’ most talented marine professionals, and we pride ourselves on our commitment to safety, quality, and professionalism. Founded on the ideals of innovation and determination, Roen Salvage has provided over 65 years of construction excellence. 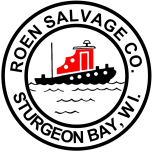 Roen Salvage is headquartered in Sturgeon Bay, WI. Roen Salvage Company is an Equal Opportunity Employer in conjunction with applicable laws.